Caveland is nested in an old 18th century winery. 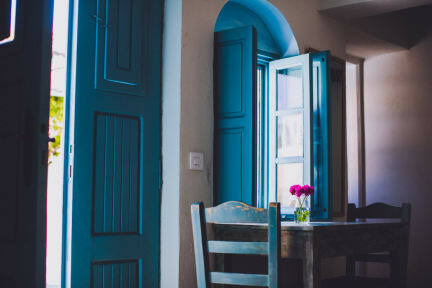 We are situated in the best spot of Santorini island, right in its heart. We are just 20 minutes walk or 3 minutes drive from a beautiful and atmospheric capital of the island Fira Town. 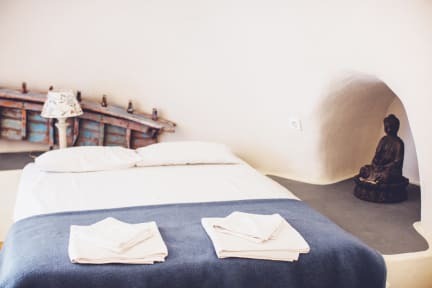 So why to spend your vacation in purpose built commercial places such as Kamari or Perissa if you can breathe the atmosphere of real Greece in one of the most picturesque and traditional villages? Ours is called Karterados. We know that summer is a beach time and that's why we have every morning transfer to the best black sand beaches. If you want to taste local nightlife, then capital city is where you should head. Other option is to join our bar crawls when after night out at numerous beach parties we take you safely back to your bed! Bellissimo ostello, atmosfera da super vacanza! Very nice hostel, located at about 25 minutes from Santorini's main town, Fira (and near a bus station). We met really nice people in the dorm, which was big, cool, had 2 bathrooms and was split into two areas, so it didn't even seem like one room for 10 people. The helpful staff, a swimming pool, free breakfast every day and activities organized by the hostel are definitely added values! Very nice place. It is a little bit far away from Fira, but there is a bus stop not very far. I loved it. I recommend it. The hostel is super nice, in real greek atmosphere and with amazing details. Is very clean, quiet and secure, you will ever meet someone there. Staff is nice and helpful, they will help you in booking car or tours, recommend restaurants, they organize an incredible dinner on thurdays. The position is very good, it's near a bus stop and near to the main city. Moreover if you rent a car (strongly recommended) it's in the center of the island, it's easy to reach every point and beach.